Upon re-reading my reviews of Lala Pipo and Audition, I realized that sexism in narratives penned by male authors has been one of my major preoccupations during the past few months. I suppose I have been reacting, in part, to a school of thought that seems to hold that anything written by a man is inherently sexist, whereas anything written by a woman must be feminist. This way of thinking is flawed for several reasons (one of the most obvious being that if gender is performative, then the act of writing gender is exponentially so), and I object to it because it unthinking dismisses the work of several of my favorite authors as unworthy of attention. Are powerful female characters in books like Gerald’s Game, Rose Madder, and Dolores Claiborne to be automatically labeled as sexist creations simply because Stephen King is male? Another writer that I feel often comes under unfair criticism is Murakami Haruki, who is ridiculed by one faction of thinkers (like Miyoshi Masao and Ōe Kenzaburō) for being too accessible and not literary enough while at the same time attacked by another faction (of mainly French and American scholars) for being a stereotypical representative of the male-dominated literary establishment. In either case, I am confounded by the intensely negative evaluation of his work as politically disengaged, sexist, or, most damningly, just not very well-written or enjoyable in general. 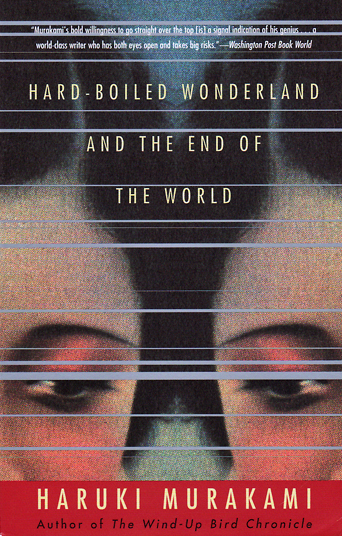 Hard-Boiled Wonderland and the End of the World is one of my favorite novels, ever, not simply because it’s very, very fun to read, but also because it’s intensely engaged with several social and philosophical issues that have become increasingly relevant since it was first published in 1985. What is an individual’s relation to a global government and economy that he cannot even begin to understand or affect in any way? What is a individual’s relation to the endless cycle of consumption imposed by these superstructures? What is an individual’s relation to a reality that is increasingly virtual; and, within that reality, what sort of responsibility does he owe to society? What sort of responsibility does he owe to himself? Surrounding these issues is an extended meditation on the nature and power of fantasy, both in its utopian and dystopian dimensions, that is woven into the very structure of the text. The narrative of Hard-Boiled Wonderland and the End of the World is divided into two parts, the Hard-Boiled Wonderland and the End of the World, with each providing the setting for every other chapter. The Hard-Boiled Wonderland is very much like present-day Tokyo, although it has been enhanced by futuristic technology and conspiracies surrounding the development and use of that technology. The protagonist of this part of the story is not a traditional hard-boiled detective but rather a skilled and deadpan Calcutec who encodes information using a special ability artificially implanted into his brain. His life runs smoothly and predictably until he is given a job that plunges him into a secret conflict between the government and an organization of information pirates called the Factory. On the other hand, the End of the World is a quiet, pastoral fantasyscape centered around a small town and surrounded by an enormous, insurmountable wall. The protagonist of this half of the story has recently come to the area and settles in as the new Dreamreader in the town library while exploring the surrounding countryside. Both the Hard-Boiled Wonderland and the End of the World are equally engaging as the reader becomes immersed in them and as curiosity builds concerning to how each world operates. Mysteries abound in either world, and the key to solving them lies at their intersection, which the reader suspects early on but whose full implications don’t become clear until much later in the story. Both protagonists are in mortal peril, from which they can escape only by solving the riddle of the two worlds. The hero of the Hard-Boiled Wonderland does this by dashing through sewers and abandoned subway lines, and the hero of the End of the World does this by strolling through the hills and woods, but both quests become increasingly urgent as their stakes become increasingly clear. One thing I appreciate about Murakami’s narrative style, however, is that his action is never non-stop. He gives his characters plenty of downtime to go about their daily lives, enjoy the worlds they live in, and interact with other characters on a casual basis. Hard-Boiled Wonderland and the End of the World in particular is a perfect blend of modern realist novel and postmodern fantasy; and, even though it occasionally acknowledges genre conventions, it is never formulaic. Every last thing about this elevator was worlds apart from the cheap die-cut job in my apartment building, scarcely one notch up the evolutionary scale from a well bucket. You’d never believe the two pieces of machinery had the same name and the same purpose. The two were pushing the outer limits conceivable as elevators. With the approach of autumn, a layer of long golden fur grows over their bodies. Golden in the purest sense of the word, with not the least interruption of another hue. Theirs is a gold that comes into this world as gold and exists in this world as gold. Poised between all heaven and earth, they stand steeped in gold. Around young, beautiful, fat women, I am generally thrown into confusion. I don’t know why. Maybe it’s because an image of their dietary habits naturally congeals in my mind. When I see a goodly sized woman, I have visions of her mopping up that last drop of cream sauce with bread, wolfing down that final sprig of watercress garnish from her plate. And once that happens, it’s like acid corroding metal: scenes of her eating spread through my head and I lose control. …but both of the protagonists of this novel are male, so that’s only natural. Whether a male writer having his male characters speak from a male point of view is inherently sexist is open to debate, but I don’t think that’s particularly the case in this novel. The idea that feminist writing is writing that resists the patriarchy and champions the cause of the weak, regardless of the anatomy of the body that performs that resistance, is a well-established argument that has its roots in the work of French feminists like Julia Kristeva and its branches in the tracts written by contemporary Japanese feminists like Ueno Chizuko. My own personal stance on the matter is that, in this light, Murakami can definitely be seen as a writer with a “feminist” agenda, as both protagonists of Hard-Boiled Wonderland are marginal and relatively powerless figures struggling against a much larger organization that directly references certain overtly patriarchal power structures in contemporary Japan. The ending of the novel severely complicates this resistance, but figuring out what the ending means in terms of politics and philosophy, as well what it personally means to you, gives it a great deal of impact. To say that Hard-Boiled Wonderland is beautifully written and compelling from its very first pages to its very last is an understatement. It is simply a great novel, easily on par with masterpieces like Neil Gaiman’s Neverwhere and China Miéville’s Perdido Street Station. I should also mention that Alfred Birnbaum has turned the book into one of the finest translations that I have ever had the pleasure to read. He captures the tone of Murakami’s style perfectly and renders it into English that is never bland and literal but always colorful and exciting. His translations of specific fantasy words, like “semiotics” (for kigōshi) and INKlings (for kurayami) are brilliantly creative. In conclusion, I suppose that haters are going to hate and that critics are going to judge, but I personally agree with the overwhelmingly popular opinion that Murakami is one of the most interesting and important living international writers – and he’s also one of the most enjoyable to read. If you’ve never read him before and aren’t quite ready to commit to a six hundred page monster like The Wind-Up Bird Chronicles or Kafka on the Shore, I think Hard-Boiled Wonderland is the perfect place to start. Thank you for another wonderful review. Hard Boiled Wonderland was my first Murakami novel, and still one of my favorites. Anyway, I also appreciate it how the women in his stories are outside of the realm of consciousness of his male protagonists. There is a strong element of “mysterious woman representing XYZ” to be found in that particular device, but you also get the sense that these female characters exist for their own purposes and have their own interiority that has nothing to do with the man. In other words, the female characters don’t revolve around the male characters – and I can get behind that. Yes, indeed. I absolutely noticed that in his books, how characters (esp women) would go off and not be seen, and would be having all kinds of stories of their own, unknown to the male protagonist and unseen in Murakami’s text. It’s definitely a noticeable characteristic of his books; I never really thought about how to describe it or name it before though. Thanks for your thoughtful review. It’s a good point about Murakami’s marginal narrators and the resistance to power in the novels. I’m a Murakami fan but have sometimes worried that women have quite fixed narrative functions in his stories, especially the lost woman. This doesn’t have to be sexist though – I tend to find his narrators refreshingly respectful of and interested in women. I found your blog via the Japanese Literature Challenge because we’ve reviewed the same book, and will definitely check back in – looking forward to finding out more about Japanese fiction. I just read your review! Murakami’s response to the interviewer from The Paris Review was pretty brilliant, right? There is a scholar named Maria Flutsch who has written a few articles about the female characters in Murakami’s novels, including the “lost women” (that’s such an apt way of putting it, by the way), and she is able to give them a fairly feminist spin. Honestly, I am such a fan of Murakami myself that I tend to resist criticizing his work, so it’s good to hear other perspectives every once in awhile. I love Murakami too; in fact I chose to write an essay on him this semester – specifically, about his representation of women in his novels. I’m inclined to agree with you about his literature being neither feminist nor sexist but something in between. Thanks – and I’m enjoying your other reviews too! Thank you! To be honest, I get the feeling that directly attacking someone for being sexist is frowned upon by all but the most stalwartly conventional feminists, so there isn’t anything I can think of that has been formally published on sexism in Murakami. Rather, it’s the kind of blithe accusation that gets bandied about at professional and graduate student conferences. There are a lot of blog entries floating around on the topic, and I’m sure you’ve already found some of them if you’ve found this one. A more specific search I might suggest is “sexism in The Wind-Up Bird Chronicle,” a novel that academics love to hate. On the other hand, Maria Flutsch has translated an article by Kasahara Mei called “Murakami Haruki’s Shōjo,” which gives a positive feminist reading of the novel. You can find the essay in the collection Girl Reading Girl in Japan, which was just published earlier this year. The best essay I’ve read on the critical reception of Murakami, however, is Matthew Stretcher’s “Beyond ‘Pure’ Literature: Mimesis, Formula, and the Postmodern in the Fiction of Murakami Haruki,” which you can probably find in The Journal of Asian Studies through JSTOR. I’m sorry that I wasn’t that helpful, but good luck! And yay for a more nuanced understanding of sexism in literature! Ha! That would indeed be funny, were I not so easily confused so early in the morning. Perhaps I should instead say that, despite the strange formatting of the essay title page, its title is “Murakami Haruki’s Shōjo: Kasahara Mei” and it is written (not translated) by Flutsch. I’m sure that you have no doubt figured out my embarrassing mistake by now, but I will let it stand as a warning to myself. This is what I get for not photocopying essays before I return the books to the library! Anyway, thank you for your response, and good luck with your project! Thank you so much for your comments! And Happy New Year to you too!